A site in northeastern Michigan, Oscoda Township, has some of the highest recorded exposure in birds to perfluorinated substances (PFASs) in the United States. Some egg and plasma concentrations at that location exceeded the lowest reproductive effect threshold established for two avian laboratory species. The objectives of this study were to determine whether there were reproductive effects or physiological responses in a model bird species, the tree swallow (Tachycineta bicolor), associated with this extremely high exposure to PFASs. 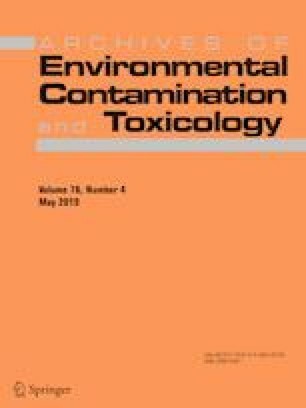 The lack of exposure above background to other contaminants at this site allowed for an assessment of PFAS effects without the complication that responses may be caused by other contaminants. A secondary objective was to determine the distribution of PFASs in multiple tissue types to better understand and interpret residues in different tissues. This can best be done at highly exposed locations where tissue concentrations would be expected to be above detectable levels if they are present in that tissue. There were no demonstrable effects of PFAS exposure on reproduction nor on most physiological responses. The online version of this article ( https://doi.org/10.1007/s00244-019-00620-1) contains supplementary material, which is available to authorized users. The authors thank Greg E. Berner, Dana Shugart, Paul Thompson, Matthew Lark, M. Lovelace, C. Brooks, and B. Fetting for weekly nest checks, the U.S. Forest Service, Huron-Manistee National Forest, MI for access to the site, and Mike Boogaard, and 2 anonymous reviewers for comments on earlier versions of this manuscript. Funding was provided by U.S. Geological Survey and Great Lakes Restoration Initiative.